This is definitely not a typical summer outfit for me, but last week, a potent cold front came through and brought temperatures down to the 50s and 60s. 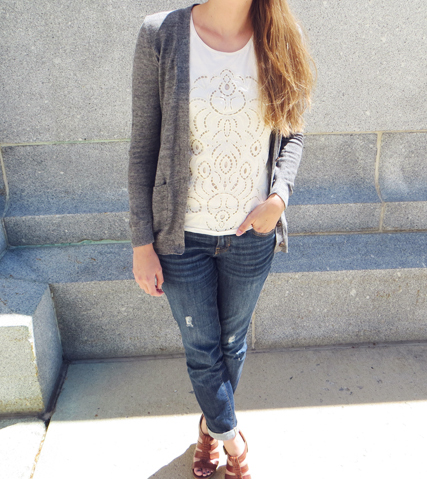 When I wore this outfit, the high reached the upper 70s, but it definitely felt cool (and nice!) since we had been reaching the upper 80s/low 90s. The building I work in is undergoing A/C maintenance, so it's extra cold inside right now (yeah--broken A/C means it's colder than usual; it's a long story). 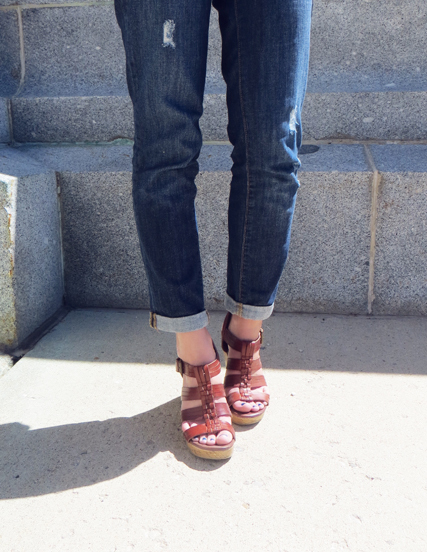 A light cardigan and boyfriend jeans were perfect for this day. Wedges are not what I usually wear to school, but I'm trying to get more comfortable in higher heels. I don't walk around that much during the day so it wasn't a problem (until Chris wanted to run to catch the bus; no way was I doing that--and we ended up missing it). In our rush to try and catch the bus, we forget to get close-up photos of my pretty earrings, so you'll have to check out the link! In other news, Ed Sheeran's sophomore album, X (pronounced Multiply), was released today! I haven't listened to the entire album yet, but there are a bunch of full-length songs he uploaded on YouTube. I highly recommend checking them out. He is so talented!